BusinessWire: ON Semiconductor unveils AR0521 CMOS sensor – the first imaging product based on a 2.2μm BSI pixel platform for security and surveillance applications. 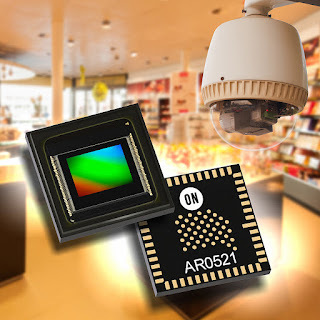 The AR0521 is a 1/2.5-inch, 5MP 60fps image sensor capturing images in either linear or HDR modes with rolling-shutter readout, and includes sophisticated camera functions such as binning, windowing, and both video and single frame modes. "The ability to deliver high resolution, high quality video feeds in low-light conditions is becoming increasingly important in many applications,” said Gianluca Colli, VP and GM of Consumer Solutions Division, Image Sensor Group at ON Semiconductor. “This new device pushes the performance boundaries and will enable the development of enhanced indoor and outdoor security systems. Particularly key to its success will be the higher resolution that does not impact low light performance and the ability to generate high dynamic range output at frame rates of 30 fps." "Platofrm fro" -> "Platform for" ?? ?